Home / Ricetta / Artichokes Roman style with couscous in pumpkin seed oil. 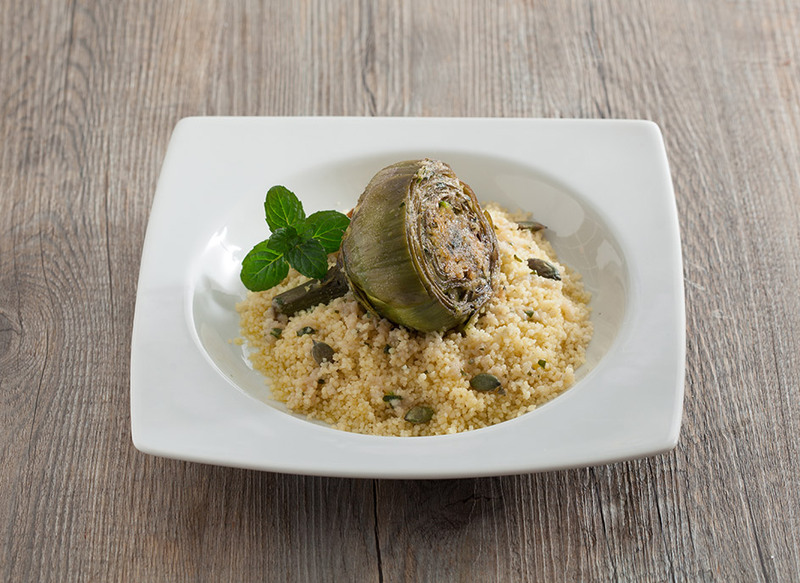 Artichokes Roman style with couscous in pumpkin seed oil. A traditional Roman dish made multicultural by the couscous. A complete, tasty, sophisticated dish. Prepare the artichokes by removing the hard outer leaves until those left are pale coloured and tender, then slice off all the tips in a single cut. Cut off the stem, leaving only a few centimetres attached to the artichoke, and trim it, removing the toughest outside part. Then try to open out the hearts of the artichokes with your hands and cut away the bristles inside with a small, sharp knife. As they are ready, place the artichokes in a bowl of cold water and lemon juice and leave to stand for at least 5-10 minutes so that they do not turn black. In the meantime, prepare the stuffing. Wash and dry the herbs. Crush and peel the garlic and remove the core. Chop all the ingredients together and transfer to a bowl with the breadcrumbs, two spoonfuls of olive oil and a pinch of salt, then mix thoroughly. Drain the artichokes carefully and fill the hearts with the stuffing just prepared. Place the artichokes upside down, stems upwards, in a fairly small, deep pan, so that they are standing close together. Add salt and half a glass of oil and a little water, covering the artichokes. Put the lid on and cook very slowly for about 30 minutes, until the bases of the artichokes are tender and the water has evaporated. While the artichokes are cooking, prepare the couscous. Bring 2 glasses of salted water to the boil then take off the heat, add a spoonful of pumpkin seed oil and drizzle in the couscous, stirring hard. Cover with kitchen film and leave to stand for 5 minutes. 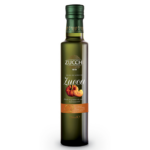 Then remove the film, season with two spoonfuls of pumpkin seed oil and fluff the couscous with a fork. Keep warm until the artichokes are ready. Now place the couscous on the plates and put the artichoke with its juice on top, so that the couscous absorbs all the fragrances; garnish with a handful of pumpkin seeds. Roman-style artichokes can be eaten hot or cold, so they are also a great idea for a lunch break.